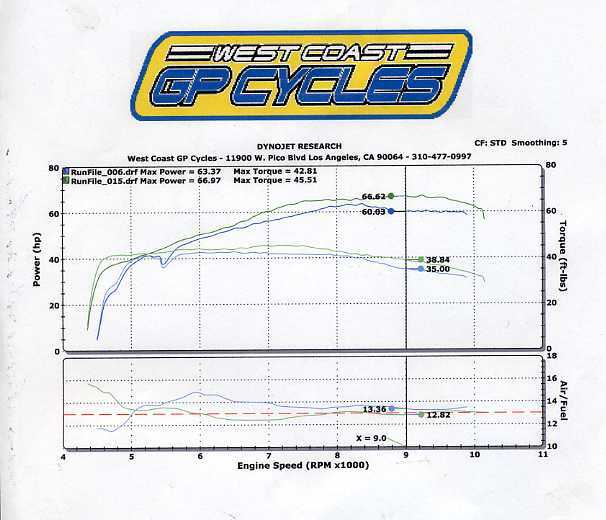 Here are some dyno runs for another 650 racer of mine…one that I built specifically for Willow Springs. 67 hp/45 ft lb! The lower trace is for the baseline on the bike- engine has my high comp pistons, Carrillos, 900ss cams, and Bruce Meyers heads. The exhaust is a 2 into 1 Conti style header with a homebuilt secondary pipe leading to a carbon fiber muffler from a 900ss. For the second trace, I pulled off the homemade exhaust part, hooked up a NOS tapered Conti Megaphone, and let her rip. You can see that the result is quite pleasant (67 hp). I also made some minor unrecorded cam timing changes, which were within a few degrees of my baseline. The exhaust, much like Pierre's racer, was being robbed of power and torque by an exhaust secondary length that acted like a low pass/high cut filter. It was too small a diameter, and too restrictive. As an added bonus, that good old Conti makes all the right sounds, too. 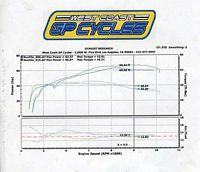 Thanks to Andy Palmer @ West Coast GP Cycles for the dyno help.